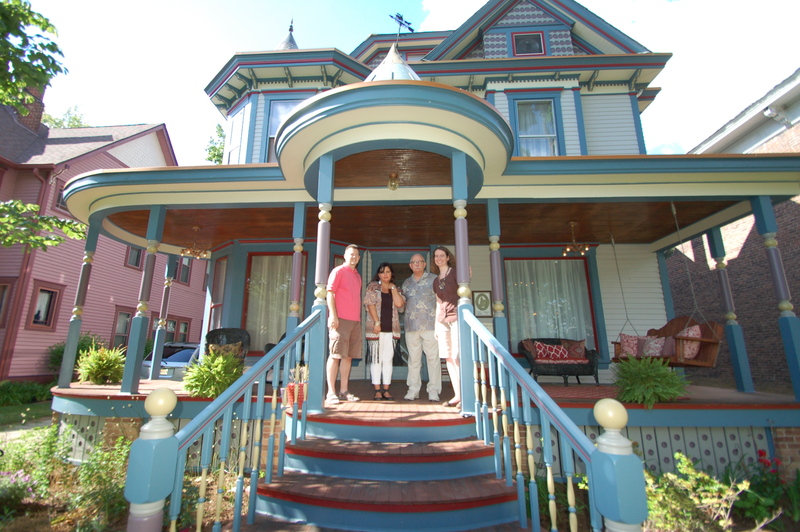 Yesterday was the most incredible day in our journey to learn more about the history and previous owners of our house. Actually, incredible isn’t even the right word. I’m not sure there is one. We spent the day yesterday with Mike Beidler and his daughter, Ronni. Their family took on the monstrous task of restoring the house back to a single family home. Like many homes in Franklin, the house was split into apartments – three to be exact – during World War II, to house officers and their families who were stationed at nearby Camp Atterbury. 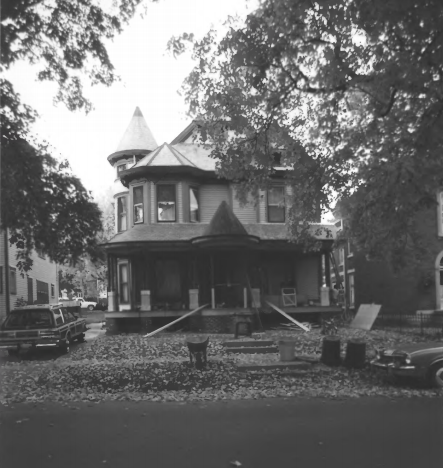 The Murray Bryant House stayed apartments up through the 1980s, when the Beidlers painstakingly began to put the house together. Remember last week when I shared the photos with the signatures on the wall? I was dying to tell you all that when I coincidentally discovered those, I knew they would be visiting the next weekend. I’m probably going to have to do several posts to document everything we learned in about 7 hours yesterday. And spend a lot of time with a scanner. I am beyond thankful that Ronni discovered my blog, and that we were able to connect. And having Mike drive in from Arkansas to share his chapter of the story that is this house – it was beyond words. Mike is a brilliant story teller, and the photo documentation that he has of their time working on the house is remarkable. Ronni’s recollections as a teenager growing up through the construction was a fantastic viewpoint, and the dots they connected for us made us love the house even more – which I didn’t know was possible. Before their visit, we had virtually no pictures of the house prior to our ownership. 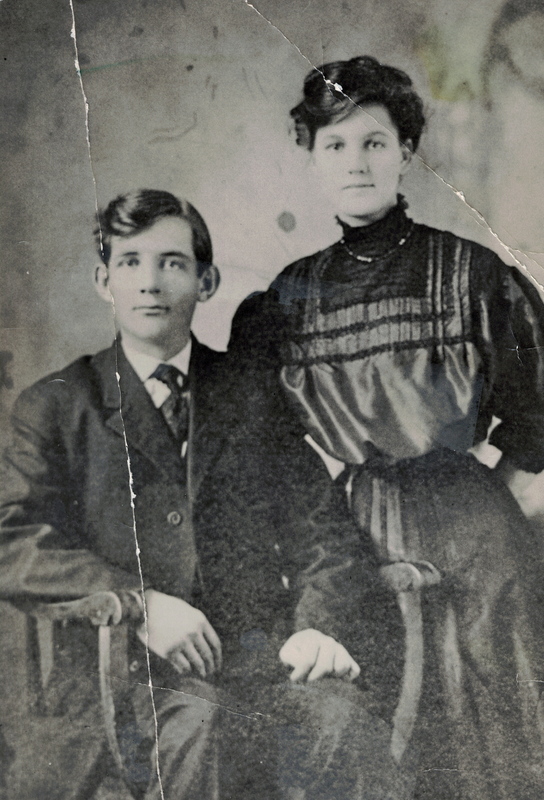 There was a picture in the Johnson County Museum of History, and also a couple from the National Register of Historic Places, but that’s it. Now, we have quite a few more. This is the only old picture I could find of the house, at the Johnson County Museum. It’s a postcard, and is dated 1910. The roads are dirt, the trees young. So, the house was 8 years old here. You can see it on the left here, light colored with the rounded porch and it looks like concrete steps. Not a great shot for details. 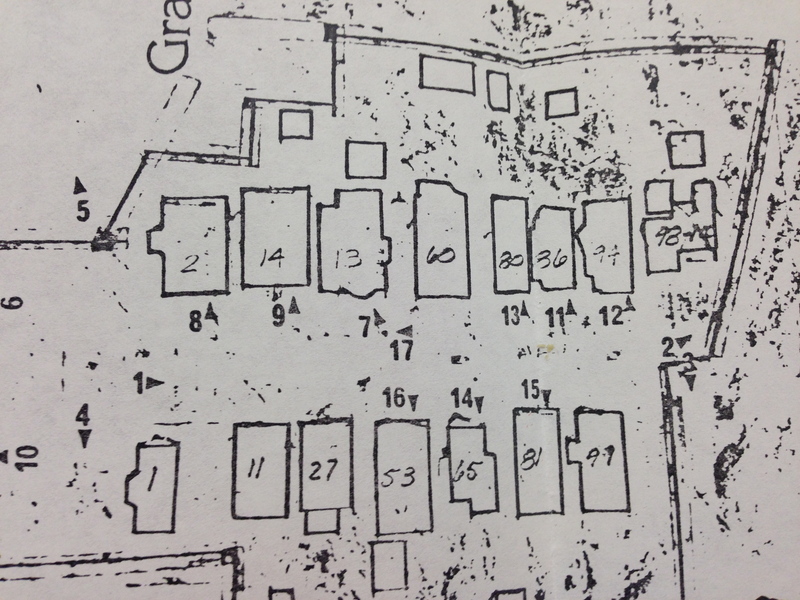 I also found this in my research, which really tells us nothing, except helps to confirm our suspicions that the house directly behind us, used to be our carriage house. I don’t have a date for this. What we already knew : first, we know that Henry Murray, a cattle farmer, built the house. I am still searching for any photos of he, or his wife Lucie. They built the house in 1902, and Lucie died of tuberculosis in 1909 (or, consumption, which sounds infinitely more Victorian). Henry died in 1923. I’m not sure if that’s when the house changed hands, or if it was earlier, but at the very least, somewhere in the late teens or early 1920s, the house belonged to Roy and Lola Bryant. 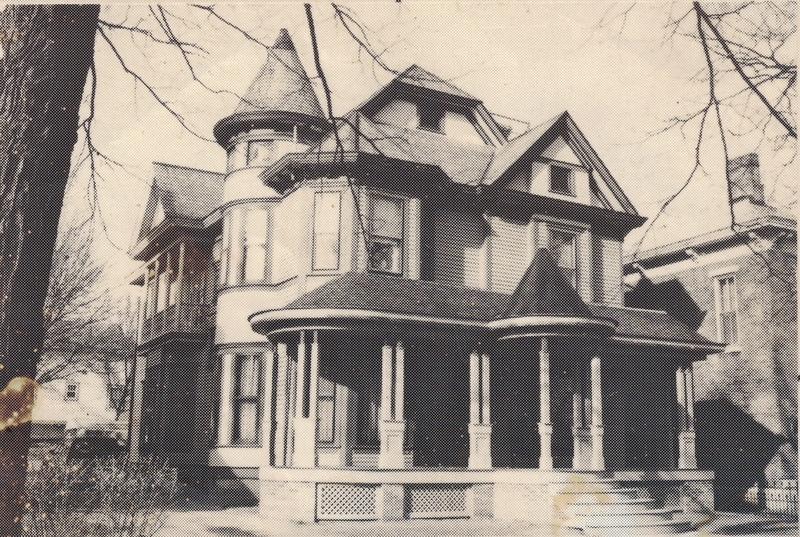 Roy was a builder, with many historic Indianapolis and Franklin buildings to his name, and owned the lumber yard down the street – L&M Lumber. Roy was mayor of Franklin from 1930-1936. By all accounts, Roy was a pretty big deal, and very influential in Central Indiana politically. I had never been able to locate a photo of the Bryants, but Ronni had one, and it’s amazing. Roy and Lola Bryant. c. 1910-1920? This next picture that Ronni had was of the house, and a trio of men / boys at the house. If the post card picture is dated correctly, I am guessing by the tree size that this picture is from the 1920s. I am very excited about this picture, because you can see the porch pretty clearly, and I think we did an okay job guessing about the columns, and am now much happier that we opted not to add railing to the porch. Note that the steps are still a concrete(?) and the foundation of the porch is all brick. Also of note – that killer swing in the front left of the picture. This shows me that, in the 20s, there were multiple shades on the house – whatever they were, we don’t know. But it definitely wasn’t all one shade. AND DID YOU SEE THIS? There’s a horse in this picture. A HORSE. This next picture is dated 1943, and since I am such a fan of winter, I am giddy to have a picture of the house in the snow. The house is clearly all one color, and looked to be white (or something VERY light). And there are awnings on the porch, which I’m not a fan of. Railings have been added to the house. Again – not my favorite. But I love that I have this documentation now! 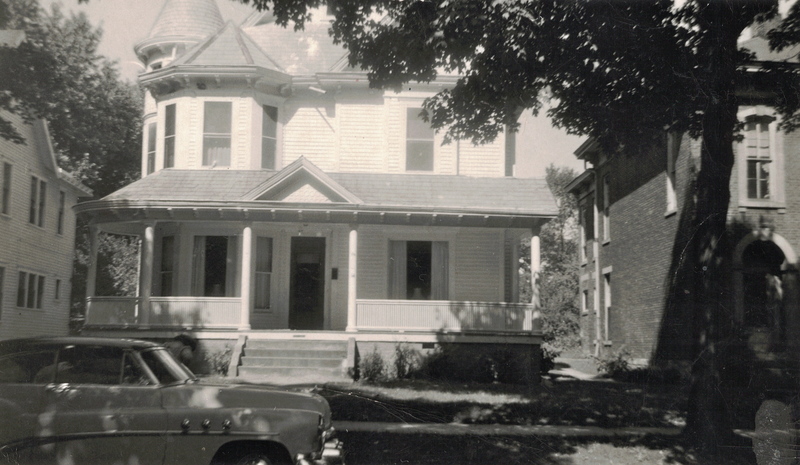 This picture is dated August, 1952, and the writing on the back declares it to be “Loraine’s Home.” More research to do! The horse has been replaced by a killer car. I’m not a car person, but surely someone can tell me what we’ve got here! Concrete steps, all white(?) still. There are definitely brackets along the soffits of the porch – we need to get those back on the house! Fast forward about three decades, full of apparently colorful people, renters, and neglect. 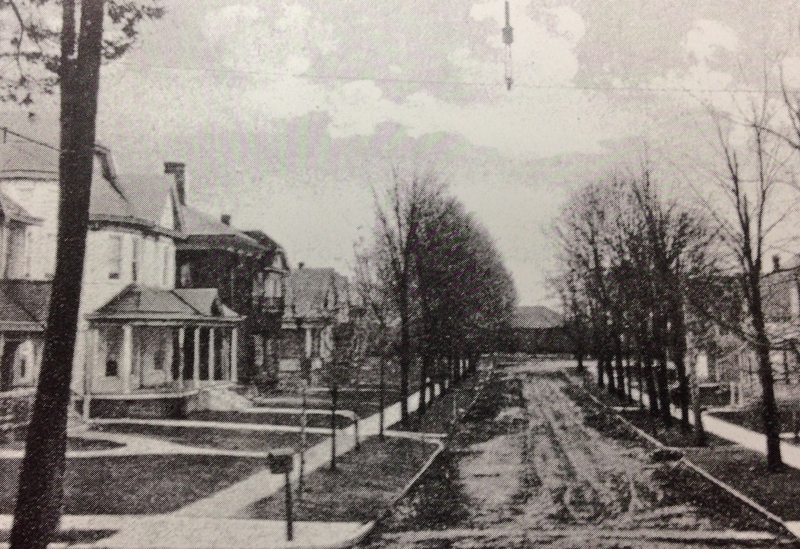 The porch had been removed – we’ve heard – in the 1960s. 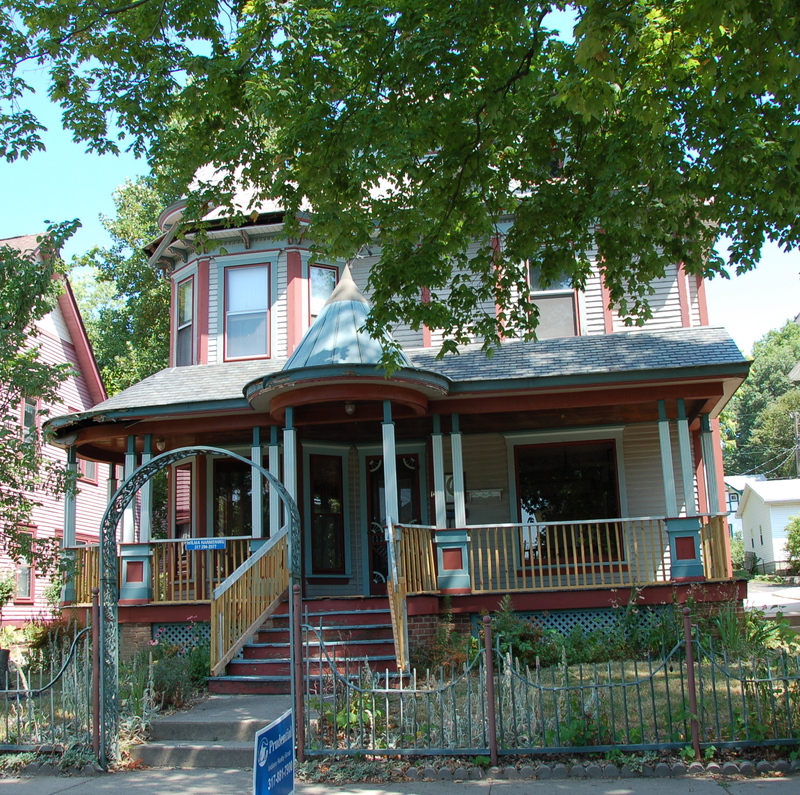 It pains me to see the house without the porch – it looks so odd! 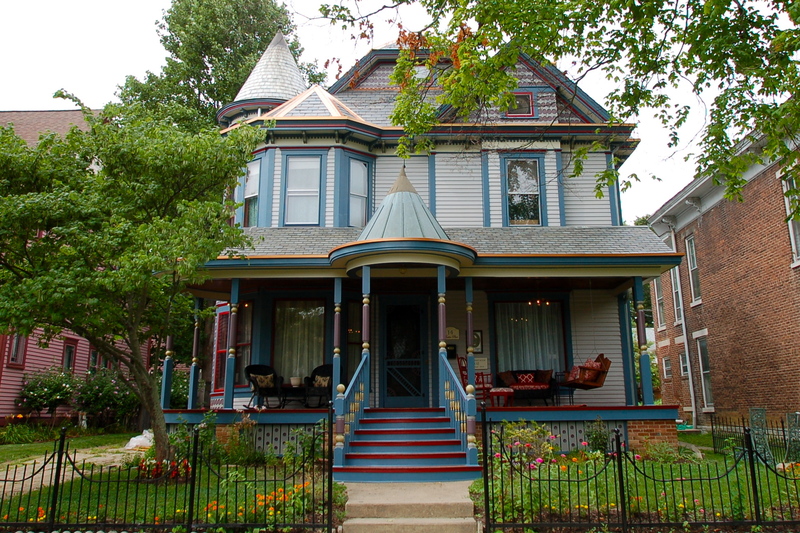 The porch was replaced by a stoop, with an awning. And a metal screen door. The original door is underneath, and we still have it. Blue and white for the colors! No metal siding, which is amazing. This photo is from 1981, right before the Beidlers purchased the home. They had been renting the house next door. When they purchased the home and began work, they lived in the downstairs apartment, and the two upstairs apartments continued to have renters in them. This picture floors me, and makes me so grateful that they saw the vision for this house. 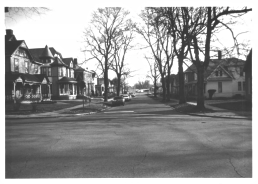 The next two pictures I’ve had for a bit – these are the pictures on the site for the National Register Nomination for Martin Place as a Historic District. These were taken in 1986, in the middle of porch reconstruction by the Beidler Family. c. 1986. National Register Documentation. 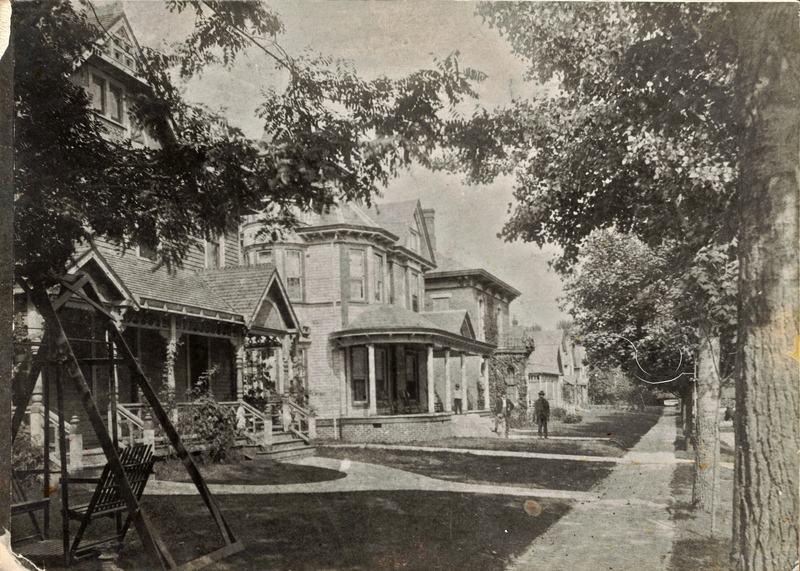 This next picture, while not in color, is a picture of the completed house, with added porch, as restored by the Beidlers. Late 1980s. The concrete steps are now wooden. 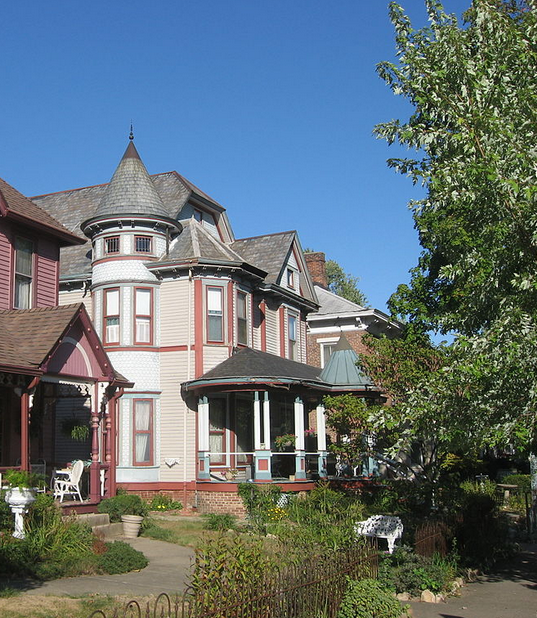 This is a picture from the Wikipedia Page for the sites in Johnson County on the National Register. I am guessing this photo was taken in the early 2000s. You can see the Beidlers color scheme, though prehaps a bit faded here. You can also see that the roof has begun to fail, and damage has begun to take hold during interim owners time. There are pots and plants on the porch, so I do believe this picture is before the house was foreclosed and became vacant. July, 2012. When we came to look at the house before purchase, it had been foreclosed on twice, and sat vacant for (we believe) at least 4 years. Major roof failure and water damage occurred during this time. August, 2014. 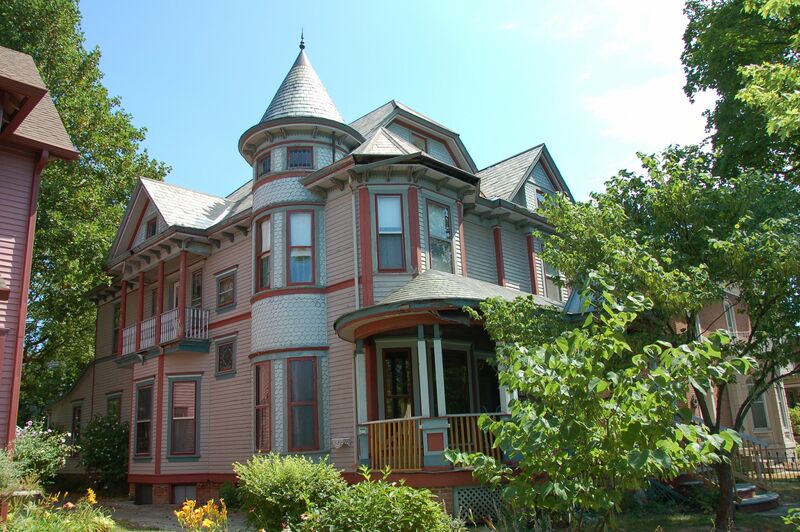 Full exterior rehabilitation of the house took two years to complete – but only because we hired people to do it. Just wait until you see what the Beidler Family did, with only themselves and a community of friends dedicated to saving houses. It will blow your mind. 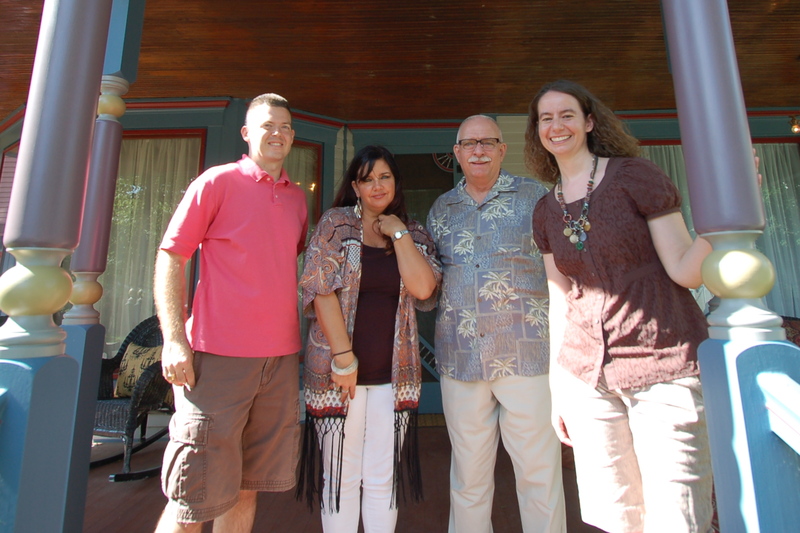 Mike and Ronni – we are beyond thankful to you, and for your visit yesterday. It was priceless to us. We loved meeting you both and Brad, and we are grateful for the wealth of knowledge you gave to us. And your gracious appreciation for the work we are doing truly humbled us, and gave us another push forward. June, 2015. The Heavilins and The Beidlers. To the Beidlers – Mike, Karen, Ronni, Randy, and Larson : Thank you for saving this house the first time, which allowed us to be lucky enough to save it a second time. We are truly humbled. Previous PostBedrooms are JUST for Sleeping. The End. I can well appreciate the utter and spectacular THRILL of these discoveries!!!!!!!!!!!!!!!! And am SO excited for you!!!!!!!!!!!!! I ASSUME so. I mean, you’re looking at everything I have on the matter. It does seems that the silhouette is the same as in the 1910 postcard, and I can’t imagine that the porch would be different after 8 years of existing. So that’s why I say yes, though I don’t have definitive proof! I must BEG for forgiveness! When I looked at the old images above (fabulous!) I thought: what are classical columns doing on a Queen Anne-style house????????? So, I assumed the columns replaced earlier, spindle-style columns, as seen on your neighbor’s porch. But…but…the style of clothing of people in the old images indicated that the the porch was way too new to have replacement columns. Well, I was quite confused by all this, so I called my friend Eric, who is an architectural historian of unparalleled brilliance. 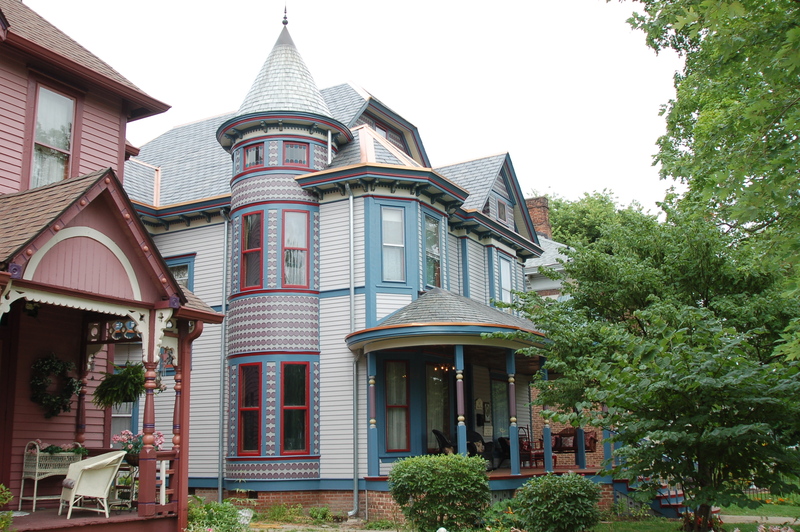 Your house, when built, was of a style heretofore unknown to me: a Queen Anne FREE CLASSIC. And FREE CLASSIC Queen Anne homes did, indeed, have classical columns (rather then spindle-style). What this means is that your house, when built, was the transitional link between Queene Anne and Colonial-Revival! How cool is that??????? 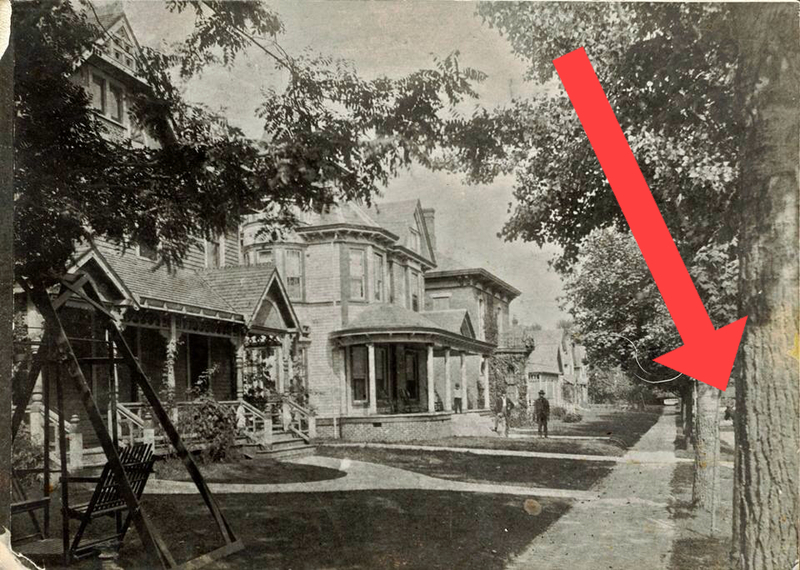 In short, I am belatedly convinced that the archival images do show the original porch. Please forgive me! I love this, and your attention to detail! Isn’t sleuthing fun? I’m excited to know the term Free Classic. I knew the house was transitional – in the documents for the National Register the only mention of the porch was that it was transitioning away from Queen Anne, and thus was restrained from excessive ornamentation. Without pictures, we really had to guess on the porch details when rebuilding, and that’s why we chose not to do gingerbread or fretwork (being broke helped that decision, too! Ha!). If we had been in possession of this picture before doing the porch, I would have probably leaned towards more classical columns. But, I’m in love with what we did, so maybe in thirty+ years when the new porch rots away, we will go another direction! I’ll just be nearing 70 then, so I’ll have plenty of time with a second porch, right?!?! Oh, and did you notice something about Roy and Lola? Do you think? Hmmmm. I don’t see twins, but they both have tremendously gorgeous hair! My non-expert, fashion history fan opinion is that the photo of Roy and Lola is probably from closer to the turn of the century during the Edwardian period. Between 1900 & 1908 typical dresses were based on an S-curve silhouette with fuller bodices and skirts with a rounded hipline in the back. By 1909, the silhouette had relaxed from the S-curve to a straighter line with slimmer bodices and skirts. Necklines also started to drop from the high, boned collar. I think you have an image from around when the house was built! Thank you, Sky! Wow! I appreciate it! 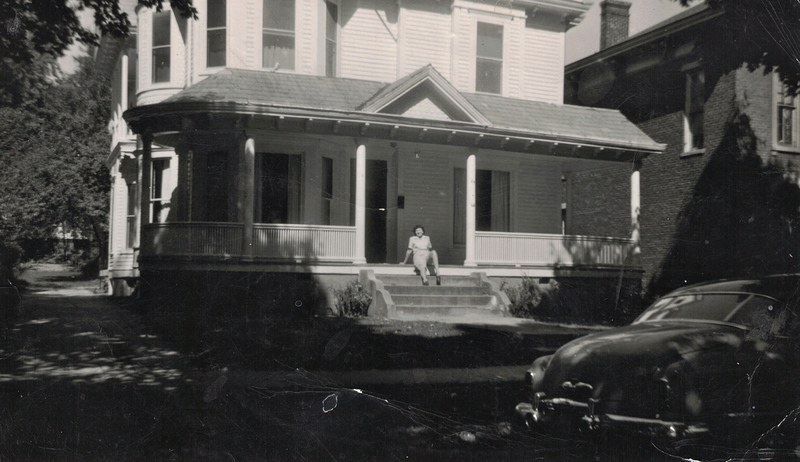 Our house was also divided into apartments during ww2 for the wives of airmen stationed at the base in Sioux Falls. A year ago, we had the family over who lived here from 1950 to 2004… I have yet to blog about it because I did t know where to start! You’ve inspired me… Might be time. One of their daughters gave me access to a google drive with over 180 pictures of my house! Egads! Oh my word! How special and perfect and AMAZING. Congratulations! What a treasure! 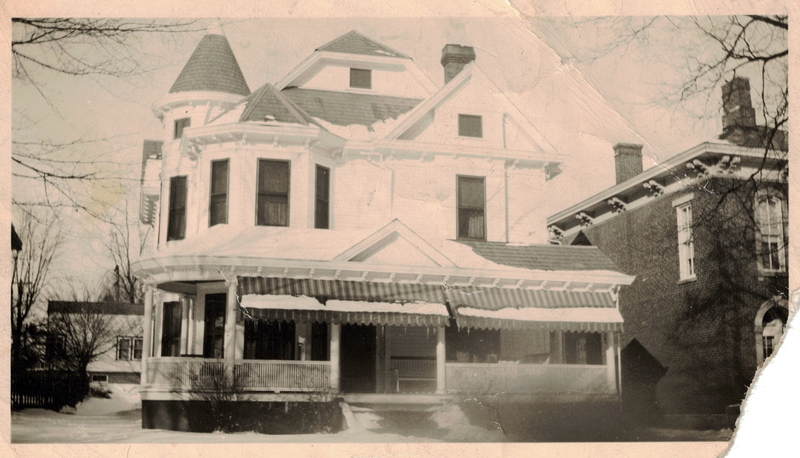 Do you know where I can find some historical info/pics of our house? We’ve been working on our house for 2 years. We’ll get it finished some day. Slowly, but surely! Ha! That’s awesome. It means I love your house. And you’re right – it’s a marathon, not a sprint for sure. We’re coming up on three years, and we have a loooong way to go! I started my search for both our Franklin Houses at the Johnson County Museum. In the basement, they have a historical records room. The volunteers in there are AMAZING. If you’re lucky, your house will have a folder of info. That can lead you to other places. There are books and records of who lived at what address if there isn’t a folder. The volunteers will help you know where to start. If nothing else, you should be able to get some names, and then it’s a matter of searching through newspaper clippings and such. It’s not always easy, but it’s fun! GOOD LUCK! Let me know how else I can help, or if you ever need help with your house! I cannot begin to express the joy this gives me and my mother! My family bought this home from the Beidler family in 1990’s. We spent the better part of a year restoring, finishing, and decorating this GORGEOUS home. 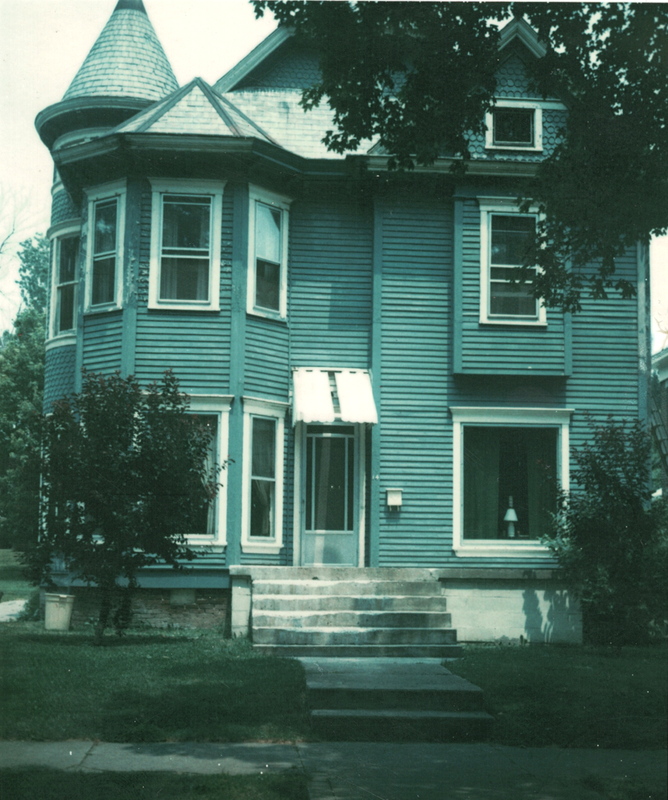 I have pictures of the exterior and interior of the house from the few wonderful years we lived there. My mother used to talk to the walls of this house that we all love so much, asking them to tell their stories. Then one day, we believe she was the Bryants daughter, an 80+ year old woman knocked on the door telling us that she used to live there. We gave her a tour of the house and told us what used to be where. We were surprised and pleased to find that the summer kitchen and giant pantry we had added she had said had also previously been there as well. We had an old antique piano in the second room that was the exact make, model, and in the same position as theirs. She shared wonderful stories about the house and town that made us love the home even more. I’m so, so, happy you value the home as much as we did. I would LOVE to come see it when we come home to Indiana next. Excellent job! Sarah! I’m so glad you found me! “Find the Breedloves” was on my list to do this summer! We would absolutely love LOVE to have any of your family over anytime. Of course, I would love to see any pictures and hear any stories that you might have. And if you have anything else related to the house, I would be super interested – the Beidlers said they left some drawings and historical papers with the house? Anyway, we’d love to learn more and meet you! It appears to be the same car in both 1952 photos – a 1951 Buick Super Riviera Coupe. MOST upscale (of course! ).